Why do you like hand embroidery and hand work? How has it influenced your life? I’ve always been what people call ‘crafty’. I’ve knitted (badly), made quilts, a quick foray into cross stitch, taught myself to crochet, made clothes, knitted toys, made bears and just generally pottered with that type of thing. For me, Embroidery fills that need to ‘make stuff’. I can just pick it up and put it down, I don’t need to go and buy a heap more stuff to start a new project. Needles, threads and a bit of fabric and I’m away. How did you start? Were you taught by your mother, school or taught yourself online? If you taught yourself what attracted you to embroidery? My earliest memory of embroidery was probably when I was about 9 or 10 with my Dad of all people when he taught me how to darn socks. For some reason I wanted his old wooly socks which had a hole in them, so he taught me how to fix the hole and I then ’embroidered’ all over them – flowers, dots, words, all sort of things. I loved those socks, not because they were beautifully embroidered but I think just because I’d created something just the way I wanted it. I started learning ‘proper’ hand embroidery stitches just over a year ago. I was surfing the net, as you do, and somehow got looking at various hand embroidery photos/sites and thought I’d like to give it a go. Which in turn lead me to TAST which wasn’t currently running at the time, but I found the previous list of stitches and I thought I’d have a go at the first few stitches on the list. A month or so later TAST started up again and I just carried on with everyone else. 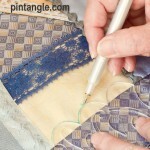 Do you use TAST to make samplers or incorporate the stitches into projects as you go. Or what sort of projects most attract you? As anyone who follows TAST on Facebook knows I make chickens, lot of chickens. So its a bit of both. A multipiece stitch sampler and each one a small stand alone project. 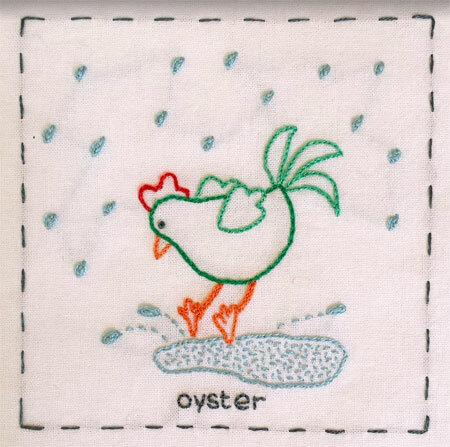 I incorporate the stitch for the week into an embroidery that includes a chicken. Gosh that sounds crazy when you write it down. I don’t think it ever really occurred to me just to do the stitch on its own and call it done. As for what projects attract me, well ‘Chicken Little’ was kind of born out of seeing photos of Sue Spargos Bird Dance quilt initially. It’s a quilt that has 30 different bird blocks that are both appliquéd and embroidered. Its bright, colourful and just fun. After embroidering for a year I now find myself being drawn more and more to the nature type embroideries, Trish Burr and her amazing needle painted birds. Martha Fieber and her misty forests. And trees, I want to embroider big beautiful trees. Can you talk about your last project and/or your current project? Well I’m still working the TAST stitch each week and this year I’ve joined a ‘Year in Stitches’ Facebook group, where the idea is no pattern, no plan and to just stitch something every day. I’m not sure freestyle is for me. But I’m using it to try some things that aren’t chicken related for one and also as a reminder for the stitches I’ve learnt to date. I’m going to see if I can use all the stitches I’ve learnt to date and every colour I own. 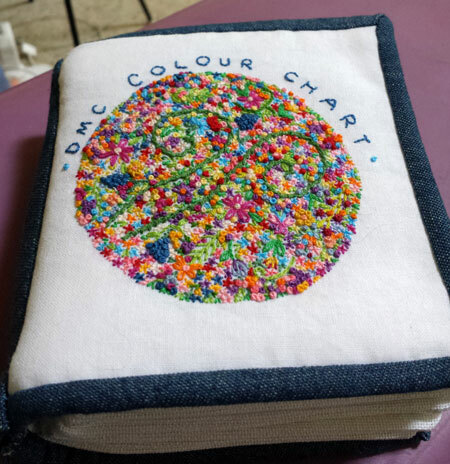 My last non-chicken project was a fabric book that’s a DMC floss colour chart. Each colour chart is actually cross stitched, but I hand embroidered the design for the cover. I created this after trying to match thread colours to a photo. I would definitely recommend making one of these. Its so helpful. What is the project you are most proud of? I still consider myself a beginner and to date I’m not sure I have something that I’m most proud of yet, I still consider my projects to date as practice. 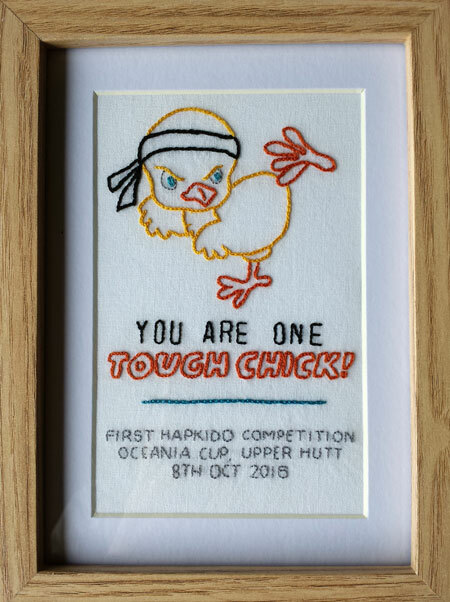 I guess if I HAD to pick something it would be a small embroidery I made to celebrate my daughter participating in her first martial arts tournament (she’s 7). I like it not because its technically complex but just because it made my daughter so happy when I gave it to her and that its now proudly displayed in her bedroom. And yes its got a chicken on it, she never would have forgiven me if it didn’t. Do you have any UFO’s? Yes, although I like to think of it more as a work in progress (cough splutter). After trying one of Trish Burrs free projects I decided to try my hand at a needle painted Waxeye, a wee bird native to New Zealand that I designed myself from a photo. I’ve stalled a bit on it as I need to do some more needle painting practice to do the wee guy justice. Do you work purchased designs or do you design your own projects? Or do you do both? For ‘Chicken Little’ I mostly use images I have found on the internet. I might tweak them slightly, but mostly I use them as they are. For other projects I like to create my own designs and apart from doing a couple of free projects I’ve found online that demonstrate a particular technique I think I will continue to create from images I find online or from photos I take myself. Do you have a creative design process? If so what is it? Or do you work intuitively? 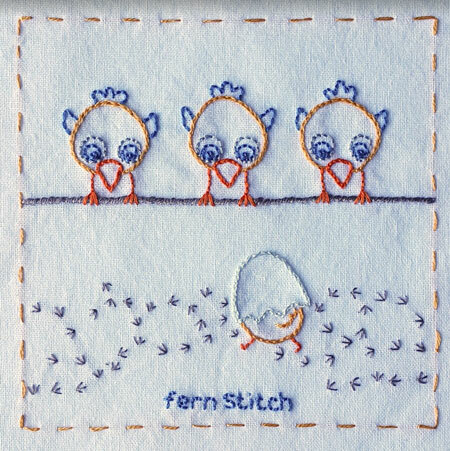 For ‘Chicken Little’ TAST, I usually try the stitch out a few times on a doodle cloth and just see if it sparks any inspiration. Like would it make good feathers? Or a platform for them to stand on? Or something else entirely. If that doesn’t work then I go through all the chicken images I have saved off the internet, I currently have about 1000 (yes I know, I’m totally loopy) and while you’d think that it’d be easy to find the ‘right’ chicken out of a 1000, its not always. But if nothing else it sometimes help me think about it differently and I can then usually find something I can modify to suit the stitch. What stimulates your creative process? What inspires and sparks ideas for you? I like looking on the net at the work of others, if I see something I like I might attempt to replicate the effect. Often I might look up the stitch of the week to see how people actually use it. I love Pinterest for pinning things I like for another time. Lots of people have trouble starting a project. What makes you start a project? Do you have any tips to get from from blank fabric to stitching? I found it really hard to start the Year of Stitches project. With Chicken Little I know I’m sewing a chicken, and I know it has to feature a certain stitch, so I’ve got the end goal in sight at least. With Year of Stitches I didn’t know where to start, I had no end goal in mind, I’ve never just free-stitched before. So I went looking for some images I liked, and came across a Koi and thought about how I could make him in stitches. Rows of Fly stitch seemed pretty obvious for the scales, and while it seems like a commonly used stitch I’m never quite sure what to do with it. So I thought it would be good practice if nothing else. And then I had a start. Now I’m just filling it with things I like, things I’ve wanted to try. It’s not going to be a great work of art when its done, but I’m learning new techniques, new uses for stitches and just learning what I like and what I don’t. Do you have stall points? If so how do you get past them? Do you have any tips to share about this? Yes definitely especially on my wee needle painting project. My current stall is how to achieve the very fine stripes on his tail. I’ve attempted to do them a number of times on another piece of fabric, all so far without success. As I’ve read in a number of places the biggest hurdle is our own sense of perfection. I just need to pick the best option and go with it, otherwise this poor wee guy is just going to remain in the drawer half done. Do you have goto stitches? I’d love to be great at long-short stitch needle painting. Do you have a favourite thread, or something you use all the time? I’ve not experimented with a wide variety of threads so far. I usually use two strands of DMC floss for most things, or one for needle painting. I use these basically because I already had a box of them from my cross stitch days 20 years ago. With the Year of Stitches I’m trying to step outside my comfort zone a wee bit and am attempting to use differing numbers of strands depending on what I’m doing. I did buy some Cotton Perle for attempting Shisha but Wow its so thick compared to floss I think I’m just a bit frightened of it. The other thing I use ALL the time is a water soluble pen. I know there are a lot of different ones out there, but I use a Chako Ace Fine Marker in blue. You don’t need to truly wash it out, I literally just do a quick swipe under the cold tap and its gone. Wouldnt be without it. What advice would you give to new hands? something you like and just give it a go. It sounds a bit weak to give that as advice, but just thread that needle and make a stitch. Then you’ve made a start, you’re off. I hope you have enjoyed this TAST Interview. Since Kimberley is not a blogger who I have I certainly enjoyed discovering more about her and reading about how goals, approaches and thoughts about her embroidery. Make a cuppa and march right on over to Morepork Manor as Kimberly’s work is fun, inventive and always a surprise. This interview is part of series that will run during 2017 as the Take a Stitch Tuesday Challenge has been running for a decade. Throughout the year I will interview stitchers about their hand embroidery and feature their work. h2>Have you seen my Stitchers Templates? Or go directly to the Pintangle shop to purchase them. What a great interview and those wonderful chickens. Thank you for sharing. I would really love to see more of the DMC colour chart if there are more pictures anywhere! thank you!! I love the chickens! And the interview was interesting. Thanks to both of you. Wonderful interview. Kimberly comes across as delightful and animated as her chicken creations. It was great to learn more about Kimberley in this interview.I always enjoy the chickens she makes and wondered how she designed them. Thanks for sharing your thoughts Kimberley! Lovely interview! So pleased to be able to get to know Kimberley better…. love seeing her chickens on the TAST Facebook page! Loved her DMC colour chart cover too! What lovely and amusing embroideries! Each TAST stitch has been used to its full potential (raindrops, foot prints…) and I think the very personal DMC thread chart is a great idea. I’m so pleased I got to know the works of Kimberley. What a fun lady Kimberley is. I really enjoyed her interview and her chickens with emotions from shy to having Attitude. Using TAST stitches is perfect for this project. Clever idea too, for the thread colour chart book. This is the first time I’ve seen Kimberley’s work and will be watching for more. Chicken Little Lady is no beginner. I so enjoyed to view all her chickens and her quirky sense of humour. Keep creating. I’ve followed Chicken Little, and am glad to hear from her creator. Loved the interview.. I enjoyed this interview with Kimberley as I’ve admired her chickens since joining TAST. Thank you for this series of interviews! Lovely to hear more from Kimberley. Every week I love her chickens.